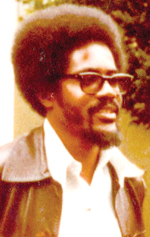 The high-profile inquiry into the June 1980 death of Dr. Walter Rodney switched into high gear yesterday, with testimonies of how the Forbes Burnham administration allegedly used the police, and a religious sect it had close relations with, to intimidate political opponents. The actions included murders and breaking-up of political meetings. On the stand yesterday were 73-year-old Lawrence Edward ‘Eddie’ Rodney, the elder brother of Dr. Rodney, and Karen de Souza. The latter described herself as an associate of the Working People’s Alliance (WPA), a party Dr. Rodney co-founded in the 1970s. Led through his statement by attorney-at-law Glenn Hanoman, it was the elder Rodney who painted a picture of the role played by the House of Israel, a religious organization led by a “fugitive” figure called Rabbi Washington also known as David Hill, who fled to Guyana in the ‘70s after problems with the United States authorities. He said that with the blessings of the administration and inaction by police, Washington and his followers of the secretive sect were given seemingly unbridled powers, accessing space on the country’s radio and breaking-up Opposition’s political meetings at will. Rodney said it was this same Alberttown-based House of Israel that was linked to Gregory Smith, an army official who was accused of killing Dr. Rodney on June 13th, 1980 with bomb believed planted in a radio set. The late 1970s and early 1980s was described as a period of fear for political opponents with arrests normal for activists. Rodney said he recalled seeing Smith dressed in the House of Israel uniform of green, red and black, on Russell Street, Georgetown. These were the same colours of the ruling People’s National Congress. Rodney said that he and his younger brother grew up in the Bent Street, Werk-en-Rust area, a stone’s throw away from the Georgetown Prisons on Camp Street. Dr. Rodney was described as a “bright” person who gained a reputation as a fierce debater at Queen’s College. He later went overseas to study, ending up eventually in Tanzania. But it was upon his return in 1974 to Guyana that he started to intensify his political work. The elder Rodney admitted he was part of the Royal Air Force of England, trained as a Signal Operator in radios, between the period of 1959-1964. He said that his knowledge was limited to the operations and not of the internal components of the radio set. Edward Rodney was in the Brickdam lockups, accused by police of murder, when he heard of his brother’s death one day later, on June 14th 1980, on the radio. He testified that the time of his death, Dr. Rodney was among five persons charged with arson for a fire at an annex of the Guyana Sugar Corporation. Rodney said that from his experience, the police were acting as an arm of the ruling party, used to break strikes. He recalled lines for basic items, with police on horses used to quell the crowds. However, he was quick to point out that there were professionals in the force. One particular incident he recalled was a strike at Guyana Stores Limited where police were present and House of Israel members came and attacked picketers. Police seemed unable to stop the sect from its actions. Questioned about the army’s role, Rodney said that soldiers maintained presence in surrounding communities whenever there were strikes. Edward Rodney asserted that Washington and his sect were “privileged”, with persons intimidated to buy plantain chips that its members would be selling. He also mentioned Joseph Hamilton, a current Member of Parliament for the ruling People’s Progressive Party/Civic, who was a strongman in the House of Israel and who allegedly made threats after attempts were made to organize at Mon Repos. One of the murders that Rodney linked to the then administration was that of Father Bernard Darke, a Senior Jesuit priest who was attached to the outspoken Catholic Standard newspaper. Fr. Darke was knifed to death in 1979 with two assailants later “proven” to be members of the House of Israel. The Catholic Standard was an independent newspaper critical of the then administration. Asked by the Commission about the main purpose of the House of Israel, Edward Rodney said that he “surmised” that sect was gearing to attract “black” Guyanese into a political, Jewish community of “special” Guyanese. However, the organization itself was a secretive one with not much known publicly of its internal workings. Asked about the House of Israel’s linkages to the People’s National Congress (PNC), Rodney pointed to May Day parades where the sect joined with the Guyana Trades Union Congress in marching to Congress Place, the headquarters of the PNC. Rodney made it clear that for Washington to be allowed access to the state radio when even the Opposition was sidelined was evidence of how close the House of Israel was to the administration. He said some of the intimidation tactics used at WPA’s meetings included cutting wires to speakers, throwing of missiles and beating of persons. Questioned by the Commissioners as to why he believed that the House of Israel was linked to the Government, Rodney said that invariably at public meetings, members of the sect would be transported and would wave placards and shout anti-WPA slogans. They were never restrained by police. Regarding Gregory Smith, described as a shadowy figure, Rodney said he met him in 1974 while preparing for a meeting. He was not dressed in any uniform and seemed to have been there with a “purpose”. He said that he later met Smith again at a number of night clubs in the city deejaying. It was in 1979, that Rodney recognized Smith again walking along Russell Street, Charlestown, with a woman and child. Smith was dressed in a House of Israel uniform. He later recognized Smith in the Catholic Standard report of Dr. Rodney’s death. Media reports had said that Dr. Rodney was blown up by a walkie-talkie bomb allegedly given to him by Smith, who reportedly fled to French Guiana where he died years later. In February, President Donald Ramotar appointed a three-person Commission of Inquiry that included Barbadian Queen’s Counsel, Sir Richard Cheltenham. Also sworn in were Guyana-born Senior Counsel, Seenauth Jairam, who has been practicing in Trinidad and Tobago since 1979 and Jamaican Queen’s Counsel, Jacquelene Samuels-Brown. The Commission started work on Monday, when police said that several files on Dr. Rodney’s death are missing. 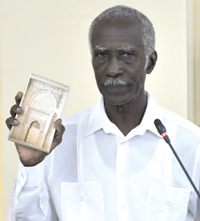 Rodney, in addition to his political work in Guyana, was well known in Africa and the region as a historian and author.